Quentin Mables, 27, is the founder and CEO of Englewood Peace Co.
ENGLEWOOD — Quentin Mables wants the T-shirts he sells to send a positive message. 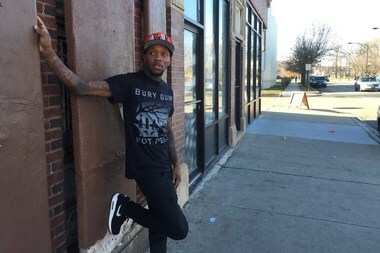 The 27-year-old Englewood resident sells shirts saying "Bury Guns, not People" for $20 at Englewoodpeaceco.com. The shirts are printed by Excel, a local, black-owned screen printing business. Eventually Mables’ business, Englewood Peace Co., will have other products such as coffee mugs, hats and jackets with similar messages, he said. Mables will donate 25 percent of proceeds to Englewood nonprofit I Grow Chicago. The organization helped change his life in 2013, he said. “As a kid I got in trouble ... I ended up catching a gun charge and spending a few days in the county jail,” he said. He started doing yoga with I Grow Chicago and became certified. The nonprofit's staff supported his business idea, Mables said, which has given him the much needed stability he said his life was missing. Because of the difference the organization’s team has had on his life and the impact it’s had on the Englewood community, Mables said he has no problem giving back to them. “I’m giving back to I Grow Chicago, so they can continue supporting others in accomplishing their dreams,” he said.